Today marks the beginning of Chinese New Year. This is the oldest, longest, and most important social and economic holiday in China. Chinese New Year, which begins the first day of the Chinese lunisolar calendar. It starts this year on February 5, though the celebrations continue for around two weeks. Chinese New Year is also known as Spring Festival and ends with the Lantern Festival on the fifteenth day of the first month of the Chinese calendar. It is celebrated across China and in many other parts of Asia with people of Chinese descent. About 20% of the planet observe this holiday. In the West, it roughly corresponds to the end of the winter season and the beginning of Carnival. Because the Chinese lunisolar calendar — which dates back to the Shang Dynasty in the 14th century B.C. — is different from the western Gregorian calendar, this festival begins with the New Moon, typically the second new moon after the Winter Solstice and can occur on dates between January 21 and February 20. The lunar cycle is approximately 29.5 days so to synchronize with the solar calendar the Chinese insert an interstitial month seven years out of a 19-year cycle. This festival observes many Chinese cultural distinctives including cuisine, art, and martial arts exhibitions. In my town of Colorado Springs, for example, a number of martial arts dojos including mine perform at the City Auditorium. In these pictures, I’m demonstrating a Chinese Tai Chi Qigong exercise (right) and the White Tiger bo staff form (below). Other customs of Chinese New Year include red clothes, poems on red paper, and lucky money in red envelopes. Red signifies fire that is believed to drive away bad luck and fireworks add to the festivities. Food includes dumplings, spring rolls, niangao (glutinous rice cakes), fish, and fruit. The celebration usually starts with a dragon dance. I’ve seen these in Hong Kong featuring a dragon of silk, paper, and bamboo that is a hundred feet long winding through the streets atop Victoria Peak held aloft by young men. The lion dance, pictured at the top, is also an exciting display with two people animating the colorful animal. Family reunion meals occur throughout the festival, which typically starts with a New Year’s Eve meal. The festival ends with the Lantern Festival which may include lanterns in art, painted with the symbols of the Chinese zodiac, flowers, animals, and birds. Lighted candles are carried to an evening parade along with the light of the full moon. Businesses in China typically take the first week of Spring Festival off as a public holiday, and people travel to visit friends and family to celebrate the New Year. Across Asia, especially those countries with large Chinese populations or those influenced by the culture of the Han Dynasty — including Taiwan, Singapore, Malaysia, Korea, Japan, and Vietnam — Chinese New year is important, and companies will take at least a day or two off. With the spread of Chinese immigration, the festival was celebrated in other parts of the world, especially in cities that developed Chinatowns. The largest celebration outside of Asia is in San Francisco. The Gold Rush of 1849 brought Chinese to work the mines and the railroads. As Chinese families were away from their families, their local community serviced as the basis for their celebration, dating as far back as the 1860s including a parade in San Francisco. 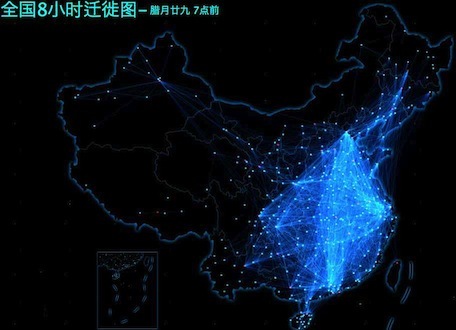 The Next Web reports that Chinese search company Baidu launched a Chinese New Year migration map that they update hourly for 8 hours daily showing the most popular migration routes. This analysis is built upon their five billion positioning requests sent to their Baidu LBS Open Platform via its products including Baidu Maps and other apps that use its positioning technology and services. I’ve worked for large Silicon Valley companies that employ many Chinese that celebrate Chinese New Year with a Chinese meal. One can appreciate that there are large Chinese immigrant populations along the Pacific Coast of America. But here in Colorado, it was the building of the Transcontinental Roadroad system that brought Chinese workers in 1865 to build the Central Pacific Railroad across to Nevada and California. Following the Burlingame Treaty of 1868, giving China favored nation status, the number of Chinese immigrants grew to over 11,000 in 1868 and almost 15,000 in 1869. The Central Pacific employed over 12,000 Chinese laborers, more than 90% of its workforce. Consequently, there was a sizable Chinese population in the American West. 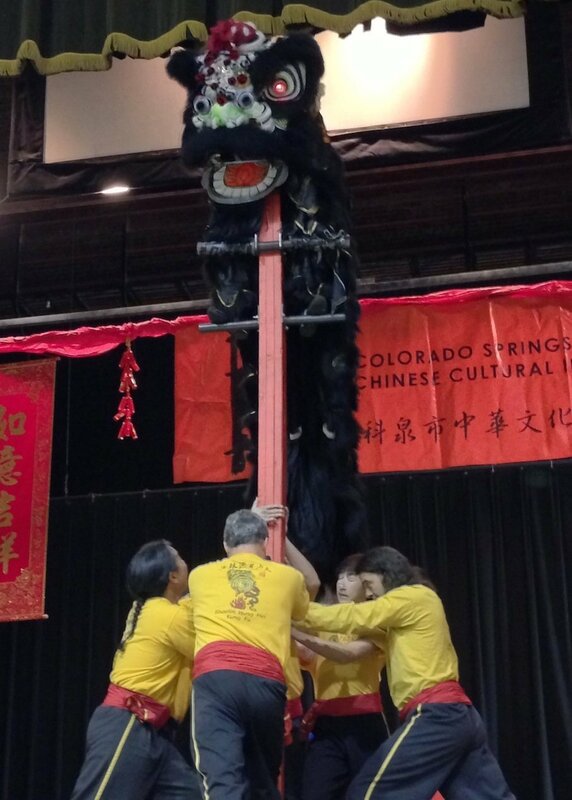 We have Chinese New Year celebrations in the major Colorado cities of Denver, Boulder, and Colorado Springs. 800 million: viewers of the Spring Festival Eve TV gala, most watched entertainment show in the world. Since 1983, it has been the family ritual to watch this cultural variety show, like the Ed Sullivan Show was in the US in the 1960s. Where is your closest celebration? Gung hay fat choy… may you become prosperous. John P. Koury liked this on Facebook. Many countries including China, Taiwan, Hong Kong, Singapore, Malaysia, Indonesia, and some other Asian countries celebrate the festival as a public holiday. The number of Chinese Spring Festival holidays in different countries varies based on the laws governing holidays in their respective countries. 愿你长寿，生活健康，生活幸福。而且，只有做好的勾当。May You Live Long, Healthy and Happy! And only good deeds!